In analysing China you often need to dive deeper than the officially reported statistics, often having to look at different ways to ‘triangulate’ different datasets in order to more solidly grasp what is really happening beneath the surface. They reveal that once again we are at an important juncture for China, with possible headwinds continuing for Australian equities, resource stocks in particular. More broadly this also has implications for commodity markets given China’s previous appetite. We have spent years doing this, and below we present some of the tools we have crafted that have proven helpful. In these charts we can see that the net capital outflows are indeed continuing, albeit at a much reduced pace over the last 6 months. When we look at the internal financial conditions within China, we see a continued building of stresses within the system, likely suggesting that the pressures towards capital flight out of China is still probably going to continue – albeit facing a more challenged environment due to the authorities willingness to embrace capital controls. 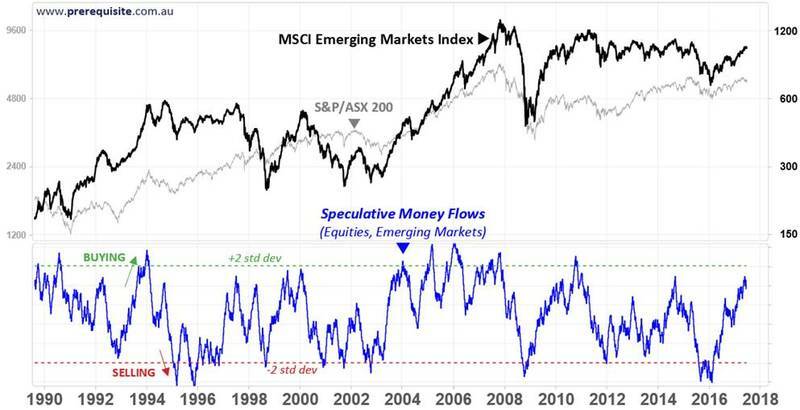 When we look at sentiment towards equities of the broader Emerging Markets, it once again appears to be approaching levels that have previously seen significant intermediate tops. Note we have included the Australian S&P/ASX 200 index in the background of the chart below. In summary, these are obvious headwinds for the Australian equity market, and for commodities more generally.